Who Wins in the Search Stakes - and How? It does not take a genius to figure out that websites most visible in searches stand a greater chance of attracting sales from consumers, but how do those big brands seem to do it? According to UK-based search marketing specialist Epiphany, which reviewed the search marketing strategies of the most visible UK financial services brands, it is essential that Google’s tools are utilised. The company says that new research suggests that when it comes to visibility in online UK searches in Google, established UK financial services brands are struggling in the face of stiff competition from online-only companies. As a result, Epiphany focused on the financial services sector and compiled a report, featuring data from search and social analytics company Searchmetrics. 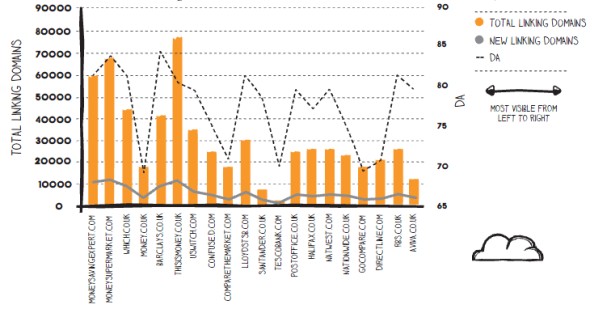 The report analysed the most visible websites across Google’s paid and organic search results. Epiphany spokesman Andy Heaps said: “Many of the brands we studied don’t appear to be making full use of facilities such as Sitelink Extensions, Seller Ratings and Social Extensions, which can help them get the most out their ad campaigns, by making their ads more prominent and appealing on the page,” Heap said. The paid visibility and SEO visibility scores used to rank the sites in Epiphany’s top 20 listings, are based on an analysis of the weekly data from the search results for millions of keywords - which Searchmetrics uses to populate the database that powers its online software for search and social marketers. Epiphany’s ‘Science of Marketing’ Financial Services Sector Report 2013, found that Moneysupermarket.com was the most visible brand in paid search and it also performed well in organic search, where it came second to Moneysavingexpert.com (which it now owns). In Google UK searches, it found that Natwest.com and virginmoney.com came in at the bottom of the top 20 most visible financial services in the paid search. 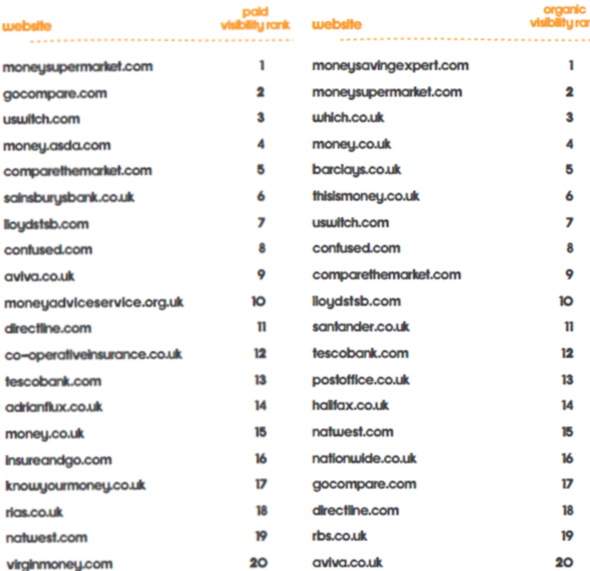 Rbs.co.uk and aviva.co.uk were the bottom two in the top 20 organic visibility searches. Online-only providers made up eight of the top 10 sites for organic search and six of the top 10 for paid search. The report noted that sites such as Barclays have done well to achieve high average organic rankings for their target keyword set. Very few sites displayed their Google+ profile information in the SERPs, indicating a limited Google+ strategy, and those sites that are present across both the paid and organic search results for their target keywords, are likely benefiting from the halo effect of achieving increased SERP ‘real estate’. The data indicates that only 25% of the most visible paid search advertisers in the top 20 listing are utilising all of the tools that Google offers to help them drive greater click-throughs via their ad campaigns. Options such as Google’s Sitelink Extensions enable the advertiser to provide searchers with links to a number of internal web pages - via one Google Adwords advert. According to Google, Sitelinks can result in an increased click-through rate of up to 30%. Seller Ratings provides the ability to include star ratings in adverts that have been aggregated by Google from a number of review sites such as ReviewCentre, Bizrate and TrustPilot. To take advantage of this, a website must have at least 30 reviews with a minimum average rating of four out of five. In relation to Social Extensions, these provide the ability to link a verified Google+ page to Google Adwords adverts. According to Google, implementation of social extensions can increase click through rate by up to 10%.